Friday, March 22 was an overwhelming day for the University of Wisconsin men’s basketball program. The Badgers’ 72–54 loss at the hands of the Oregon Ducks brought with it the end of an up-and-down season that never saw Wisconsin reach its full potential. 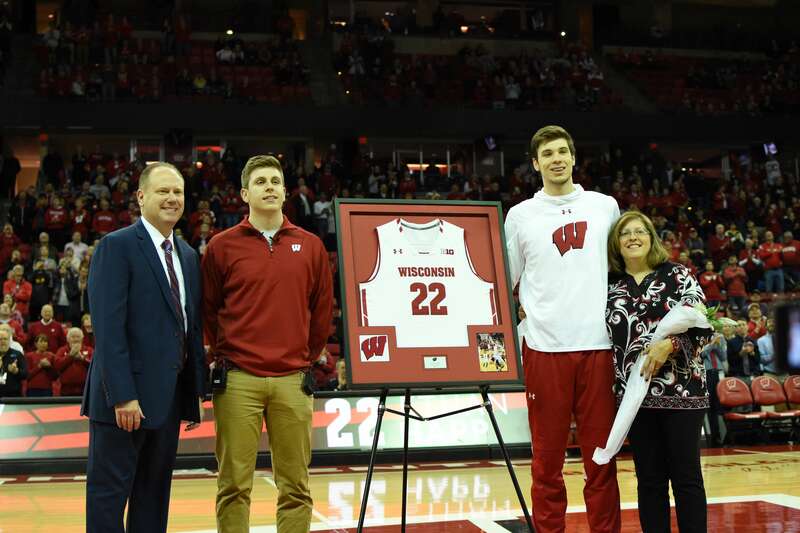 It was also the final game of Ethan Happ’s career — a career that logged over 4,000 minutes and a number of individual achievements. Most recently, Happ was named a consensus second-team AP All-American, becoming the first UW player to make an All-America team in multiple seasons. But Wisconsin’s loss in the first round of the NCAA Tournament also signified a marked improvement from a 2017-18 season in which the team failed to make the big dance for the first time in 20 years. This season, Wisconsin won 23 games against the sixth toughest schedule in the nation, according to analytics expert Ken Pomeroy. Fifteen came in the Big Ten, which had seven teams win in the first round of the NCAA tournament. The Badgers also boasted the fourth-best adjusted defensive rating in the country, per Pomeroy’s analysis. 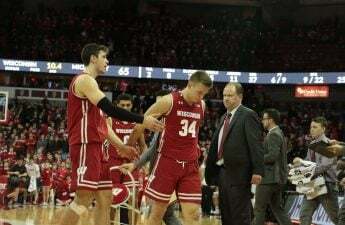 The team’s rebound from an embarrassing season presents optimism moving forward while also raising uncertainty as to whether Head Coach Greg Gard can replicate its recent success. That is to say that despite the team’s drastic improvements from a year ago, it relied too heavily on Happ’s offensive production in the vast majority of games this season, while too often Happ’s supporting cast was nowhere to be found late in games when their presence was most needed. Much of Wisconsin’s inconsistency this past season had to do with the nature of its Happ-centric offense. There is no doubt that Happ was the team’s best option all season long, but working the offense through a 6-10 power forward who spends the majority of his time on the low-block can be problematic in today’s college basketball landscape, which demands more backcourt creativity and athleticism paired with consistent perimeter shooting. By increasingly depending on Happ over the course of the season, Wisconsin’s primary backcourt — Brad Davison and D’Mitrik Trice — were largely stripped of their playmaking and offensive abilities. As the season wore on, both players’ shooting efficiencies dropped significantly. Take Trice, who shot a robust 50.7 percent on 3-pointers and nearly 49 percent from the field over the season’s first two months. As the team entered the new year, Trice appeared to be a worthy second option on offense for Wisconsin. Similarly, Davison shot 39 percent from 3 over that same stretch. Following his initial tear, Trice tailed off — shooting just 31 percent from the floor and 32 percent from beyond the arc over the season’s final 21 games, while Davison’s clip dropped to 32.7 percent. Now, one can directly attribute these shooting woes to the rigorous Big Ten defenses that Wisconsin faced during the second half of the season. One can also argue that Happ’s playmaking ability provided more ample perimeter scoring opportunities for Trice, Davison and others throughout the Big Ten season. But neither of these explanations excuse the team from its immutable offensive approach and lack of execution. With no Happ to lean on offensively, the Badger backcourt, 7-foot Nate Reuvers and others will suddenly be responsible for a larger share of the playmaking and scoring burden. That means that Trice and Davison will largely be tasked with facilitating the offense — setting the tempo and creating opportunities for each other and their teammates, which is something they haven’t had to worry about during the Happ era. Happ’s exit — as well as Khalil Iverson’s — also opens the door for Kobe King, a former highly-touted prospect who has struggled to solidify his role in Wisconsin’s offense over the last two seasons despite demonstrating promise defensively. King played well for the Badgers in the Big Ten tournament, but other than providing temporary defensive effort, he has not accomplished much yet in his career. With the offense opening up now, King can grow into a more consistent and, hopefully, more effective role coming off the bench for Trice and Davison. His shooting must improve — King shot just 30 percent on 3-pointers in 2018-19 — but there is certainly promise. Plus, he has the confidence of Gard, whose encouragement of King after the team’s loss to Michigan State in the Big Ten tournament semifinal signaled an increased role moving forward. Gard may also benefit from Micah Potter, who transferred to UW from Ohio State earlier this year. UW will file an appeal to the NCAA to try to get Potter in time for the 2019-20 season. If the appeal fails, Potter is eligible to play following the first semester. Potter presents some Big Ten experience and solid perimeter shooting, which should surely benefit Gard’s offense and help stretch the floor for his teammates. The Badgers are also expecting Tyler Wahl, who appears to be the team’s lone 2019 recruit, to make an immediate impact in the Badger rotation. At 6-foot-7, Wahl can help fill the hole left by Iverson’s departure, particularly on the defensive end. Wahl’s length gives him a ceiling of defensive utility that perhaps even Iverson could not reach. Time will tell. If this year’s NCAA Tournament has proven anything, it’s that pairing a slower offense with a tenacious defense can still win games. But you need consistent guard production on offense to win games. Look at the National Championship game — Wisconsin measures similarly to both Virginia and Texas Tech on the defensive side of the ball, but was nowhere close to matching their respective offensive productions come tournament time. Virginia’s backcourt of Kyle Guy and Ty Jerome is among the nation’s best, while Texas Tech’s Jarrett Culver looks poised to be an NBA lottery pick. 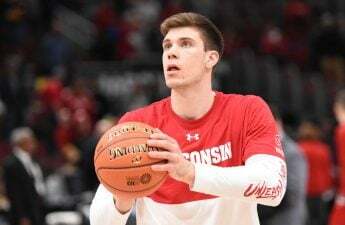 Should we expect next year’s Badgers to be the same team they were in 2018-19? Probably not. Losing Happ and Iverson will hurt the team on both sides of the ball. But their exit also gives the program a unique opportunity to rebrand itself and acclimate to an ever-changing sport. It will undoubtedly look awkward at first, but Happ’s departure opens the door for Wisconsin to reform its offensive identity into one that better suits the state of basketball in 2019.